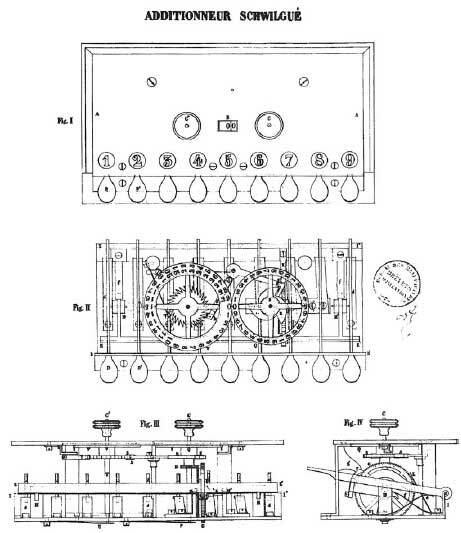 In 1844 the French Jean-Baptiste Schwilgué from Strasbourg (see biography of Jean-Baptiste Schwilgué), together with his son Charles, patented a key-driven calculating machine (brevet d'invention N°624, and brevet d'invention N°623, pris le 24 décembre 1844), which seems to be the third key-driven machine in the world, after these of James White and Luigi Torchi. 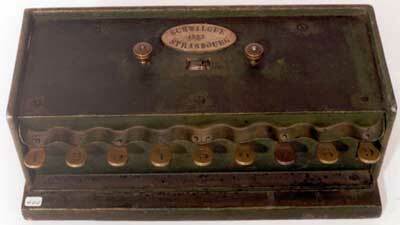 In contrast to the machine of Torchi, however, the Schwilgué's is a simple adding machine for single columns adding. Similar machines will be invented and manufactured by many inventors in the next 60 years. Jean-Baptiste Sosime Schwilgué (1776–1856) was a famous french engineer and inventor from 19th century, Officier de la Légion d'Honneur, best known as the architect of the last astronomical clock in Cathédrale Notre-Dame de Strasbourg, built from 1838 until 1842. 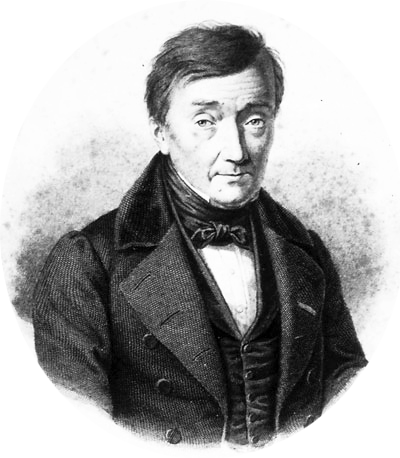 Schwilgué made a number of preliminary studies years before, such as a design of the computus mechanism (Easter computation) in 1816, and built a prototype in 1821. This mechanism, whose whereabouts are now unknown, could compute Easter following the complex Gregorian rule. The astronomical part is unusually accurate: it indicates leap years, equinoxes, and much more astronomical data. Schwilgué was trained as a clock maker, but also became professor of mathematics, weights and measures controller, and an industry man, whose particular focus was on improving scales. After the completion of the clock and following a change in the French patent laws, Schwilgué, with or without his son, patented several inventions, including the above-mentioned small adding machine. 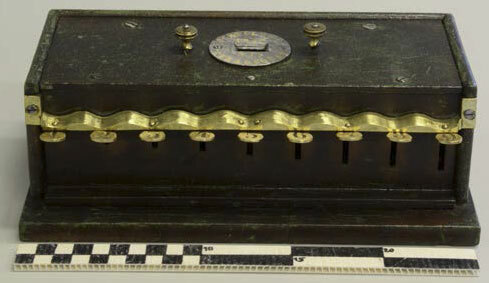 This adding machine appeared in the 1846 catalogue of Schwilgué’s tower clock company, but was most probably devised some 10 years ago, in the middle 1830s. As of now, several copies of the machine are known: one is in a private collection (Boutry-Ungerer family), one (dated 1846) in the Strasbourg Historical Museum (the machine is in poor state and carries the Nr. 15), and one (dated 1851) is in the collections of the Swiss Federal Institute of Technology in Zurich (see the lower photos). 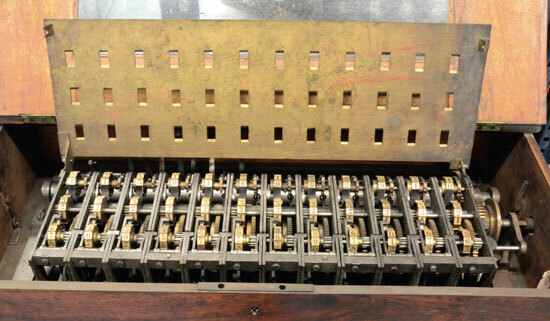 In closed status, the machine is a box with nine numbered keys, an opening showing two or three digits in two parts, and two knurled knobs. It is 25.5 cm long, 13.6 cm wide, and 9.5 cm tall (without the knobs), weight 3.3 kg. The inside of one of the machines is almost identical to the patent drawing (see the next figure). Schwilgué’s machine has three main functions: addition, carrying, and setting. The upper figure shows figures I, II, III, and IV of Schwilgué’s patent. Figure IV shows how the keys operate. Each key can move downward by an amount corresponding to its value and moves the wheel G, but only when the key is released. (Schwilgué stated, however, that this can be changed). This wheel meshes with wheel H (horizontal on Figure III), and the unit wheel moves counterclockwise by as many digits as the pressed key. The unit wheel is the wheel on the right of Figure II. It contains each digit three times. The units and tens wheels can be set using the knurled knobs, so that before an addition the openings would show 00. On the Zurich machine, resetting the wheels is made easier by pins located under the wheels. When the knobs are pushed downwards, R or U disengage, but the pins are put in the way of stops so that one merely has to turn the knobs until it is no longer possible. It may seem surprising to see such an invention, long after more sophisticated calculating machines such as Thomas’s Arithmometre (1820), or even the Roth machine (1841). It must, however, be understood that Schwilgué’s machine was never meant as a general adding machine. Schwilgué, who had obtained a number of patents since the 1820s, was no doubt well aware of Thomas’s machine and other general calculating machines. We know, for instance, that Schwilgué had a copy of the description of Roth’s machines, as well as a copy of a history of calculating instruments published in 1843 by Olivier. It is possible that these articles were an incentive for Schwilgué to build his calculating machine, or they may have been part of his research for his own machine. Unlike that of the general-purpose calculating machines, Schwilgué’s purpose was to ease a particular operation, the hand checking of addition. In these cases, only small values were handled, and Schwilgué didn’t bother to build a machine with 10-digit inputs, although it could probably have been done with his carrying mechanism. Instead, Schwilgué could see that the existing machines, although powerful in principle, were of little use for everyday accounting. 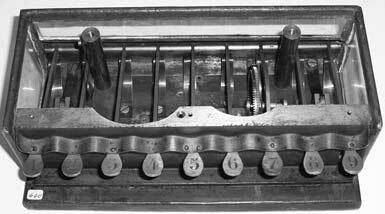 Schwilgué’s machine was designed to fill that gap by using keys to input numbers. Schwilgué could see their potential, even though he never claimed to have invented the keyboard. After all, keyboards already existed on musical instruments. The one, that has already been mentioned, is the use of a clock escapement-like way of adding the carry, although Schwilgué never qualified it that way. This feature seems also present on Schilt’s machine. The patent drawing also shows that the keyed figures are only taken into account when the keys are released. However, Schwilgué stated explicitly that both are possible, either upon pressing or upon release and that the patent covers both. Schwilgué also mentioned an interesting feature which he called ‘‘tout ou rien’’ (all or nothing). Besides the name, which alludes to binary logic and may have been borrowed from Julien Le Roy in the context of repeating watches that had to ring all chimes or none, it was here an optional feature ensuring that a digit was only taken into account when the key had been completely pressed. However, according to Schwilgué, this was not really needed as one learned quickly to operate the machine and not to make mistakes. A similar safety measure was introduced only in 1913 in the ill-fated E-model of the Comptometer of Dor Felt. On that, an automatic blocking device prevents errors and forces the operator to repeat pressing a key that was not adequately depressed. It is known also, that in the middle 1840s Schwilgué constructed a bigger specialized calculating machine (information for it was kindly provided my Mr. Denis Roegel), a solid brass device with 36 result wheels, kept now in the collection of Historical Museum Strasbourg (see the lower photo). This machine was advertised at "300 to 400" francs in 1846 (about three months salary for a common laborer of the period), and at "400 to 500" francs in 1847, but it seems unlikely that any was sold, because it was too specialized. This specialized machine had a single purpose—to calculate multiples of some value using additions, and on 12 digits (i.e. the machine works with 12-digit integers, and it computes their multiplies in sequence). In 1830s and 1840s Schwilgué made several gear-cutting machines, which position is given by angles at regular intervals. To be able to calculate the angles with a large accuracy, Schwilgué wanted to compute the fractions 1/p, 2/p, 3/p …, p/p on 12 places. Thus the output of the calculating machine (values were copied on paper) can be used as an input for the gear-cutting machine. The machine is a weight-driven device with a modular design and includes 12 almost identical blocks (one for each place), a command arbor, and a command block. A crank is provided (normally not used), for rewinding the machine and clearing carries. Once the machine is rewound, a detent is shifted and the mechanism does one addition, then stops. This operation is repeated until the machine is rewound. After each computation, the values are copied on paper. The command block is similar to a striking clock with two 54 teeth wheels, a pinion of 9 leaves, a second wheel of 47 teeth, and a double threaded worm. The weight is attached to a string which is wound around a drum driving one of the 54 teeth wheels, and this wheel meshes with the second 54 teeth wheel, as well as with the pinion. The second 54 teeth wheel drives the command arbor. The pinion drives the second wheel and the worm which leads to a brake and an arm stopped by the detent. When the detent is released, the arm is freed and the mechanism turns, until the detent again meets a notch on the 54 teeth wheel of the command arbor. 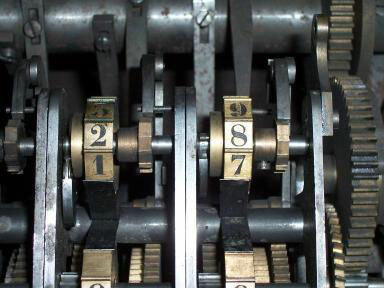 There is also a notch in the other 54 teeth wheel, and the two work together as in common striking clocks. When the command block is triggered, the 54 teeth wheels perform one turn and so does the command arbor. This arbor is tangent to the 12 blocks and carries 24 arms, organized helically, two per block. It is a natural consequence of the relative position of the blocks, of the arbor, and of the need to sequentialize the additions at each place: first the units, then the tens, etc. The arrangement of the computing blocks dictates the structure of the command arbor. Each block displays three digits and the three sets of 12 digits represent three 12-digits numbers. One is a simple counter, and it will show 000000000000, 000000000001, 000000000002, etc. The other is a constant and will never change during an operation. It will for instance store a value such as 076923076923 for 1=13. The third one will merely show the multiples of the constant. There are therefore two independent, but synchronous, functions: the counter, and the multiple. These functions are synchronous, so that one value (the counter) could serve as an entry to the second (the multiple). In the case of the counter, the machine has to add one to the units, and to propagate the carries. In the case of the constant, the constant must be added to the stored sum, and carries have to be propagated. Each of these two functions is obtained by two arms of the command arbor. One arm is for incrementing the counter, the other is for adding one digit of the constant to one digit of the sum. 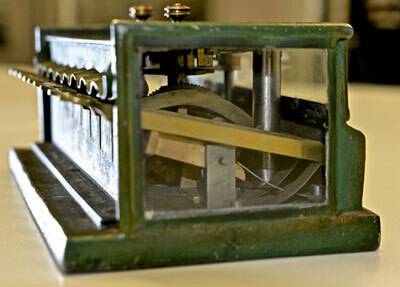 The prototype of the machine was probably constructed in 1844, but the earliest known plans are from 1846. Later the machine seems to have slightly evolved and the above-mentioned device follows plans dated 1852. Schwilgue's bigger machine should be remembered as an exceptional example of his engineering genius and as a rare example of an early specialized calculator, full of subtle features.